As most of my regular readers and friends would know, this last year has been a little crazy for me on the translation front. First of all, I seem to have started a little side-job. Over the past year, around half of my work has appeared on other websites, commissioned by others in the fandom. I know that I probably can’t make a career out of this, and to be frank, I’m not entirely sure I want to. Nevertheless, I’ve learned A LOT with this experience. Not only have I become more careful about double-checking that I’ve gotten the meaning correct, I also push myself to find the right words to convey it. The staff and cast of the shows we love are people too, and I really hope that their personalities come through in my work! Speaking of which, here’s the latest interview I’ve done: Kajiura Yuki and Takahashi Ryo talking the music of Princess Principal, commissioned by Nachi and co-funded by Canipa, the Pauseandselect community, and JackUTS! 4. Yuri!!! on ICE: Kato Taihei, the Bento announcer! Unfortunately, there was also a downside to my slightly increased presence in the fandom this year. I’ve gotten pushback before, with Macross Frontier and Chihayafuru coming to mind as a comparison. But I can say that this past year has been far more frustrating that either of those other two experiences were. There’s a lot I could say about some of the ‘feedback’ I’ve received or comments I’ve seen about translations I’ve either done or made statements about, but I honestly do not want to revisit any of it. All that matters is that the people whose opinions I care about would back me most of the time; when they don’t, then theirs is the feedback that I take on board. I won’t name them, lest they become targets (they should know who they are), but I am truly grateful to them. Let me also take the opportunity to thank a few people specifically. Thank you to Josh for starting me down the freelance path back in 2016. Thank you also to Nachi, Canipa, and anyone else who’s ever commissioned something from me, or otherwise contributed to funding an interview I’ve translated. I’m indebted to Frog-kun, Tora and the two offline-only friends who helped me with the interview snippets that I wasn’t 100% sure about. And thank you also to the three translators whose work I checked and edited—whilst you might feel that you gained more from the experience, let me assure you that it was invaluable to me too. But most importantly, thank you to one of my oldest friends, who believed in me and invited me to be part of something that I will never forget. Interpreting at that event was challenging, and there were definitely moments where I feel I could have done better. But no joke, I’d do it all over again, in a heartbeat. Not a very big update this time, because I’ve already written about the major event that dominated my summer (well, winter, technically)! Actually, I also thought that I’d only have one thing to report, but looking back through WMC, it turns out that I’d built up a bit of a backlog of contributions there. I should really do a better job of crossposting them here ^^; In any case, here are four more behind-the-scenes pieces I’ve touched that came out this last quarter. First up is another of those editorials on anime writing. When megax began putting together a series of posts on anime pre-production, I figured that it was time for the posts I’ve first envisioned when I began this project in April last year: From Story to Script. Featuring Aldnoah.Zero, Yuri!!! 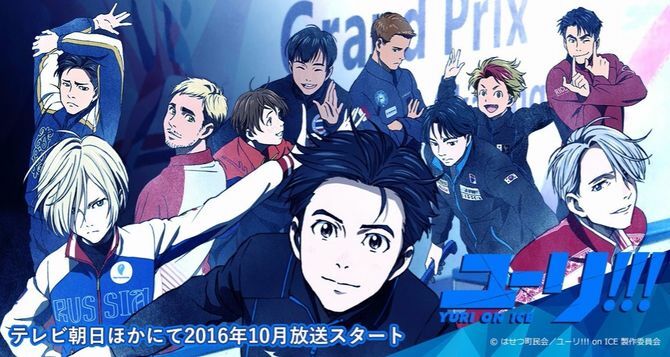 on ICE, SHIROBAKO and more! The second and final piece in this series has been completed — I really don’t know when it’ll be published, but I’ll post it here as well as on twitter. Following on from that, WMC ran a Lupin month, which you should all check out if you like any of the works in that long-running franchise. With help from Nachi-san, here’s an interview on the musical soundscape of Lupin III: The Woman Called Fujiko Mine, with Director Yamamoto Sayo and the Jazz maverick Kikuchi Naruyoshi whom she invited to do the music. A bit later that month, Josh published the first snippets of the Kizumonogatari work I’d been doing for him. It’s basically a glimpse of how words from a script make it to the final product that we see on the screen, so do check it out if you’re curious about how anime are made! That’s it for now. I was going to write that there wouldn’t be a Reflections on Summer post, as I didn’t actually pick up any of the season’s shows. But then I remembered that I have seen several anime films that did make their first appearances in the West this summer, so look out for that, along with a brief Ghibli retrospective! Well, here’s my first translation from the guidebook. Perhaps unsurprisingly, I chose to start on the real life skaters that Figure Skate Life interviewed: this time, I present the young bloods Ryuju Hino, Kazuki Tomono and Koshiro Shimada! And here’s my ‘Anime Writing’ post for this week! This interview, from Spoon.2Di vol.18 (published September 30, 2016) is one of the earliest interviews that Kubo Mitsurou did for Yuri!!! on ICE. If I’m not mistaken, it’s her second magazine interview, after the short one in the October edition of Pash!1 In it, Kubo expands on the way all the stars lined up such that, in the summer of 2014, she embarked on a journey to help Director Yamamoto Sayo create the figure skating anime that the latter had long been dreaming about. If you prefer to read the Japanese original for yourself, aliasanonyme has shared the scans here. This is the full translation of the interview that I discussed in this editorial. As I mentioned there, I originally intended to post it back in January, until frog-kun advised me to write a more in-depth piece about the mistranslations and misinterpretations we found. I only addressed one of them in the editorial, but if you’re curious about the other major mistakes, you can take a look at them here. But if you’re only interested in what Kubo herself said about Yuri!!! on ICE just before it started its broadcast, you can find it right here, just under the cut. If you’re a member of the hard-core Yuri!!! on ICE fandom, what has happened over the past few weeks can hardly have escaped your attention. 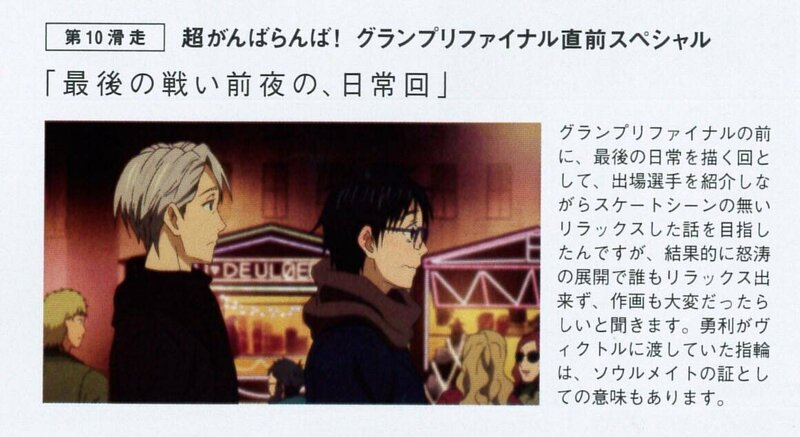 On February 7, the March issue of CREA saw Kubo Mitsurou—who’s credited for the original story and the scripts—indicate that Victor and Yuuri can be thought of as “soulmates,” inciting cheers and celebrations in various places around the web. Then on February 10, her comments in Pash! about the rings being akin to items worn by “members of the same circle” created a fair amount of consternation amongst fans who believe Yuuri and Victor to be engaged.